Earlier this month a tractor-trailer carrying orange juice crashed along North Carolina’s Interstate 95. The driver fell asleep at the wheel and the truck traveled into the median and hit the guardrail. The passenger was killed and the driver suffered injuries. The driver was charged with careless and reckless driving and misdemeanor death by motor vehicle. Similarly, a truck driver in New England has been criminally charged following a fatal accident with a motorcyclist. The driver was operating a fuel truck for his employer and struck the motorcyclist after failing to yield. Due to previous license suspensions for a prior DUI, the driver was required to only drive vehicles with an ignition interlock device installed. The fuel truck did not have an ignition interlock device, and it is unclear whether the employer was aware that the driver was legally not allowed to drive without one. The consequences of a large truck collision are often dire. Large trucks are more unwieldy and take longer to decelerate. Commercial driver inexperience, exhaustion, and impairment are a few of the other factors that can lead to tragic accidents. Liability for injuries can extend past the commercial driver to the trucking company for poorly maintained vehicles, inadequate inspections, and improperly loaded trucks. Manufacturers of the truck or instruments used by the truck may also contribute to an injury-causing accident. At the end of last year, the U.S. 4th Circuit Court of Appeals issued an unpublished opinion that looked at whether or not the manufacturers of a texting system installed in the cab of the truck should be held liable to the family who suffered injuries and the death of their child following an accident by a truck driver who was texting using the system. The family appealed a lower court ruling, asserting that the texting product required the driver to look at the texts from the dispatcher instead of the road while the vehicle was moving. The manufacturer denied that they owed a duty of care to the family. The lower court and appellate court both held that the manufacturer was not responsible for the driver’s misuse of the texting system. All personal injury and product liability actions require the following to be shown: 1) that a duty of care was owed to the injured, 2) that there was a failure in that duty, 3) that an injury occurred as a result of that failure, and 4) the amount of damages that resulted from the injury, otherwise known as the monetary compensation that would be needed to be in the same position prior to the accident. Immediate documentation and investigation following an accident can help preserve evidence of negligence on the part of the commercial driver, trucking company, or truck manufacturer. The North Carolina truck accident attorneys at Auger and Auger, aggressively pursue every avenue of legal relief available to provide you and your family with the compensation that is needed. They have several years of experience dealing with auto and commercial vehicle insurance companies, and understand what is needed to successfully litigate a personal injury claim. If you or a family member has been injured in a commercial truck accident, call our office for a free, confidential consultation at (704) 364-3361 or (800) 559-5741. As summer vacation begins in North Carolina, safety and health concerns surround planned trips and activities. Whiplash is often associated with car accidents, but may also be caused by roller coasters and other amusement park rides, sports injuries, or being punched or shaken. Whiplash is defined as an “injury to the soft tissues of the neck from a sudden jerking or ‘whipping’ of the head”. The muscles and ligaments of the neck are over-extended past the normal range of motion. Cars in a collision often cause this type of injury to the driver or passenger because the body is restrained, but the head continues to move with the car’s original direction, which can result in the whiplash injury. The difficulty with treating whiplash is that pain and stiffness may occur in the first few days after the accident and then the injured person begins to feel better. However, the pain and stiffness can return and these symptoms can last months or years. That fun day at the park can lead to several months or years worth of pain due to negligent care of the park’s land or poorly constructed products or warnings on products you take to the park. It is the park’s duty to maintain safe premises and rides for their customers, and their failure to do so can result in liability for damages caused by negligence. In North Carolina, the statute of limitations to file a claim for personal injury is three years. That may seem like a long time, but deadlines to file suit rapidly arrive as the determination for who or what caused the injury may require a lengthy investigation. Most statute of limitations begin to run on the date of the accident or injury. The statute outlining when an action must be filed does allow for the limitation period to begin when the physical damage to the body becomes apparent or should have become apparent to the injured person, but it is best to file as soon as possible. Personal injury claims often require the use of expert witnesses in order for fact finders to understand the evidence. North Carolina Rule of Evidence 702 states that “if scientific, technical, or other specialized knowledge will assist the trier of fact to understand the evidence or to determine a fact in issue, a witness qualified as an expert by knowledge, skill, experience, training, or education may testify in the form of an opinion.” In North Carolina a three step inquiry is used in determining whether the testimony of an expert should be admitted: 1) Is the method of proof sufficiently reliable?, 2) Is the witness qualified as an expert in that testimony? and 3) is the expert’s testimony relevant? 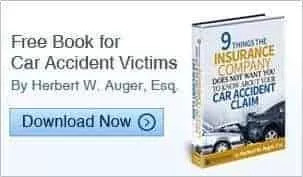 The North Carolina whiplash injury attorneys at Auger & Auger have worked with several expert witnesses to help maximum the compensation the client deserves. Herbert and Arlene Auger know how to find and use the best witnesses available to testify about complex, scientific matters related to your injury. If you have suffered a whiplash injury from a car accident or amusement park ride, then call one of our experienced attorneys at 888-487-0835. The North Carolina Court of Appeals recently affirmed an award granted by the Industrial Commission (I.C.) to an injured employee. The employee suffered an accident that injured her left shoulder. She returned to work as a machine operator, but then required surgery to repair a cerebral aneurysm. She was unable to work following the surgery, and was granted medical fees and a temporary total disability award from the Industrial Commission. To limit liability and payment of disability, the employer and insurance company claimed that the injured worker had returned to suitable employment, thus the award of disability should have ended upon her return. The North Carolina Workers’ Compensation Act allows an employee to attempt a trial return to work. During that period, the injured employee is paid compensation for any disability, and is entitled to compensation if the trial return is unsuccessful. Benefits may continue until the injured worker returns to a suitable job. Injured workers who sustained their injury before June 24, 2011 can receive Total Temporary Disability indefinitely, but workers injured after this period are capped at 500 weeks. Suitable employment is employment offered to the employee that is within the employee’s physical capabilities and training and within a 50 mile radius of the injured employee’s residence at the time of the injury. The governing statute states that no one factor shall be considered exclusively in determining suitable employment. The defendant employer and insurance company in Church v. Bemis Manufacturing Company argued that the worker had returned to suitable employment and that she was not fully incapacitated. The injured worker testified that she had trouble putting heavier lids on boxes and found it difficult to lift anything over 10 pounds. She often required help and the more she worked, the more her injured arm hurt. She had limited education and vocational skills, and would have had difficulty finding work in another field. The Commissioner and Court of Appeals both felt the testimony related to the worker’s injury and experience fully supported a finding of total temporary disability for the worker. Receiving the care you need is not always as straightforward as it should be. The Industrial Commission recommends five steps for those that have been injured at work so injuries are properly reported, the injured worker receives the appropriate medical treatment quickly, and the workers’ compensation benefits are initiated by the employer. An injured employee should first report the injury to the employer and seek out medical care. The employer may have on-site health care available to the injured. Second, the injured worker should inform the health care provider that the injury is work related, so that they bill treatment as a Workers’ Compensation Claim. Third, the Industrial Commission suggests that you inform the manager or owner of the company. Fourth, the I.C. suggests that a written description of the accident is given to the employer and that a copy is kept for your own records. Lastly, the I.C. recommends that you follow your physician’s instructions. Documentation is important in all claims that may end up in front of a judge. All information submitted regarding the accident at any point of the claim may be used later, so it is beneficial for the information to be thorough. The experienced North Carolina workers’ compensation attorneys at Auger & Auger provide injured workers with the knowledge they need throughout the claims process. If you or a family member has been injured on the job and wants to ensure that the necessary compensation is received, contact our office for a free, confidential consultation. An accident off of 1-40 occurred earlier this week in North Carolina. Seven people in a sport utility vehicle were driving back from a beach trip when the teenage driver ran off the road, hit a guardrail, over corrected, and flipped the car twice into the opposite lane. The reported ages of the driver and the passengers ranged from 16 to 21. Two of the passengers were seated in the cargo area without seat belts. One passenger was seriously injured and four others were taken to the hospital. Teenage driving is replete with risk. The Centers for Disease Control and Prevention states that drivers aged 15-24 account for almost 1/3 of the total costs of motor vehicle injuries. The risk of accidents with teens is believed to be larger than other portions of the population due to their inability to appreciate dangerous or hazardous situations as well as more experienced drivers. Teen drivers also have a lower rate of seat belt use and an increased likelihood to drive with alcohol in their systems. North Carolina utilizes a graduated license system so drivers can comfortably learn the road while minimizing the risks to themselves and others on the road. A Limited Provisional License restricts any teen between the ages of 16-18 from driving unsupervised before 5 AM and after 9 PM. The supervising driver must be a licensed driver, licensed for at least 5 years, and seated next to the driver when supervising. Even then, the teen may only drive unsupervised directly to or from work or any voluntary fire, rescue, or emergency medical service. There can also be no more than one passenger under the age of 21 years of age in the vehicle with them, and cell phone use is banned while driving on public vehicular areas. If an accident does occur and a teen is behind the wheel, the financial repercussions and legal liability of the accident may be borne by the parents of the driver. Parents may bear some of the financial responsibility if the teen driver is sued and they either own the car or have the teen insured under their family policy. In North Carolina, the Family Purpose Doctrine holds the vehicle owner liable if the driver was negligent while using the car for a family or household purpose. North Carolina courts have held that liability occurs if the operator of the car was a member of the family or household of the car’s owner, that the car was provided and maintained for family use, and that the car was used with expressed or implied permission. In the North Carolina Court of Appeals case, Tart v. Martin, 137 NC App 377 (N.C. App, 2000), a nineteen year old son who lived with his parents ran a stop sign and collided with another vehicle. The court ruled that a parent holding the title to a car and assisting with payments did not fall under the Family Purpose Doctrine since the car was driven and maintained exclusively by the son. However, the court ultimately found that the parents, who knew of the son’s bad driving record, could be held liable under the theory of negligent entrustment. The theory of negligent entrustment holds the owner of an automobile liable when they entrust the car to someone they know who knew or should have known that they were an incompetent or reckless driver likely to cause an accident. The North Carolina Teen Car Accident attorneys at Auger & Auger know how to find you the compensation you are entitled to and need to recover from your injuries. If you have been injured in a car accident with a teen driver and would like to talk to one of our experienced attorneys, call our office today for a free, confidential consultation at (888) 487-0835.